After delving into the cause of wi-fi router interference, LG has redesigned the shielding on future production batches of the Thunderbolt 3 UltraFine 5K display —but not only may this not directly address other user's connectivity complaints, how existing monitor owners will get the problem fixed is not yet clear. "LG apologizes for this inconvenience and is committed to delivering the best quality products possible," said LG in an emailed statement to Re/Code. "All LG UltraFine 27-inch 5K displays manufactured after February 2017 will be fitted with enhanced shielding." LG has confirmed that existing models will be able to be outfitted with the enhanced shielding, but how this will be accomplished for owners using the displays now hasn't been announced, other than LG promising "prompt service." "LG clearly has a responsibility to get [the UltraFine 5K displays currently in the hands of consumers] up-to-date with the new shielding," a person within the company told AppleInsider under a condition of anonymity, because they were not authorized to speak publicly on the matter. "We have nothing to announce at this time, but we are speaking with LG to figure out how best to get this accomplished." Other users report that they suffer from the same disconnect symptoms as that induced by nearby wi-fi routers, but without a nearby wi-fi router. While the enhanced shielding will probably eliminate issues induced by the networking gear, if the monitor is sensitive to other frequencies the specific shielding may not solve everybody's problem. During the course of AppleInsider's UltraFine 5K review, for example, the evaluation unit was tested in a suburban environment within three feet of two different operating 802.11ac routers, without any problems. The same unit is being used in a city now without close proximity to a Wi-Fi router, and is having connectivity issues manifesting from an unknown source. AppleInsider announced in-depth testing on a pair of LG UltraFine 5K displays afflicted by the problem on Thursday. "RFI shielding for electronic gear isn't universal, and this is a complex problem," our test supervisor informed us on Friday morning. "What you shield, with what material, where you put it, and how much of it you use depends on a lot of factors. I don't think that they'll blanket the entire monitor's electronics with a shield plate, because there just isn't enough empty space." In the course of testing, two of the monitors were disassembled by the team —one afflicted by the connectivity problems, and one not. AppleInsider was informed that there are no discernible engineering or shielding differences between the two, and the monitors are described as "well-put together" and sufficiently shielded, based on other monitors tested in the past. "It could also be a combination of factors," we were also told by our test head. "There could be a few places that aren't shielded enough, and if 2 out of 3 are impacted, or 4 out of 7, or if this location is hit by 2.4 GHz wi-fi and that other by something in the 800MHz range, the connection problem may only pop up then." The LG UltraFine 5K Display is considered a replacement for Apple's discontinued Thunderbolt Display, offering a 5,120-by-2,880 resolution, a P3 wide color gamut, and the ability to charge a MacBook Pro using the same Thunderbolt 3 cable used for video and data transfer. 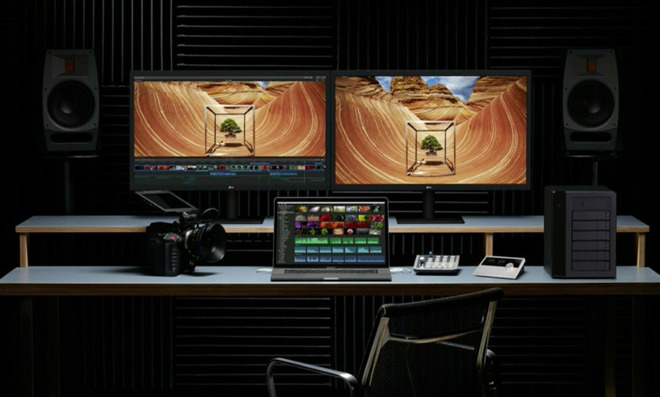 The monitor is on sale from Apple directly for $974, a discount of 25 percent from the usual $1,299.95 price.